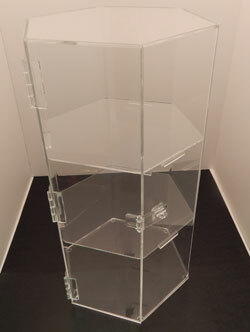 This is a mini tower display case that features a rotating base(optional). With the rotating base you customers can more easily browse your products. The clear design also lets the maximum amount of ambient light into the display area to increase your products visibility. The locking mechanism helps to keep your merchandise safe from theft. The acrylic materials used in the construction of these display cases is of high quality and offer a large amount of durability. This durable 2 bar jewelry display case will allow your customers to view your product from every angle, while keeping them safe and secure with it's locking hinged door.